Although we still have a lot of work yet to do, we should take a day to honor the accomplishments of the women that came before us. It's up to us to pick up the torch and continue to move Women's Rights forward. We still need to finish the job of securing an Equal Rights Amendment. "I call upon the people of the United States to celebrate the achievements of women and recommit to realizing gender equality in this country." "In 1912 Alice Paul met up with her friend, Lucy Burns, and they took over the National American Woman Suffrage Association (NAWSA) Congressional Committee, trying to get a constitutional amendment giving women the right to vote. By 1916, she formed the National Woman's Party (NWP) that demanded a constitutional amendment guaranteeing women the right to vote. " 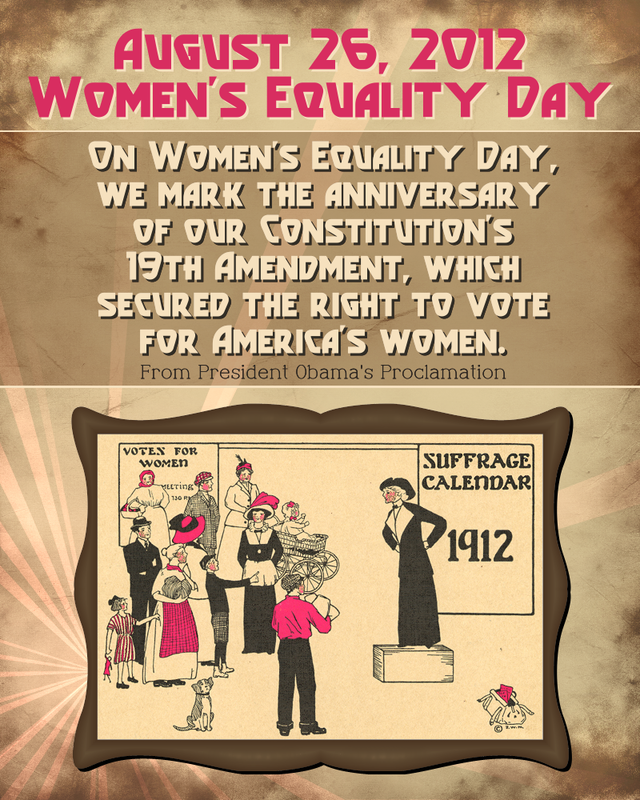 On Women's Equality Day, we mark the anniversary of our Constitution's 19th Amendment, which secured the right to vote for America's women. The product of profound struggle and fierce hope, the 19th Amendment reaffirmed what we have always known: that America is a place where anything is possible and where each of us is entitled to the full pursuit of our own happiness. We also know that the defiant, can-do spirit that moved millions to seek suffrage is what runs through the veins of American history. It remains the wellspring of all our progress. And nearly a century after the battle for women's franchise was won, a new generation of young women stands ready to carry that spirit forward and bring us closer to a world where there are no limits on how big our children can dream or how high they can reach. To keep our Nation moving ahead, all Americans -- men and women -- must be able to help provide for their families and contribute fully to our economy. That is why I have made supporting the needs and aspirations of women and girls a top priority for my Administration. From signing the Lilly Ledbetter Fair Pay Act into law and creating the White House Council on Women and Girls to combatting sexual assault and promoting women's economic and political empowerment at home and abroad, we have worked to ensure women have the opportunities they need and deserve at every stage of their lives. As women around the world continue to fight for their seat at the table, my Administration will keep their interests at the core of our policy decisions -- and we will join them every step of the way. Today, women are nearly 50 percent of our workforce, the majority of students in our colleges and graduate schools, and a growing number of breadwinners in their families. From business to medicine to our military, women are leading the fields that were closed off to them only decades ago. We owe that legacy of progress to our mothers and aunts, grandmothers and great-grandmothers -- women who proved not only that opportunity and equality do not come without a fight, but also that they are possible. Even with the gains we have made, we still have work to do. As we mark this 92nd anniversary of the 19th Amendment, let us reflect on how far we have come toward fully realizing the basic freedoms enshrined in our founding documents, rededicate ourselves to closing the gaps that remain, and continue to widen the doors of opportunity for all of our daughters and sons. NOW, THEREFORE, I, BARACK OBAMA, President of the United States of America, by virtue of the authority vested in me by the Constitution and the laws of the United States, do hereby proclaim August 26, 2012, as Women's Equality Day. I call upon the people of the United States to celebrate the achievements of women and recommit to realizing gender equality in this country. IN WITNESS WHEREOF, I have hereunto set my hand this twenty-fourth day of August, in the year of our Lord two thousand twelve, and of the Independence of the United States of America the two hundred and thirty-seventh.